Miss Kendra: Faith, I want to make a hat for my trip to Vegas. How do I go about doing this? 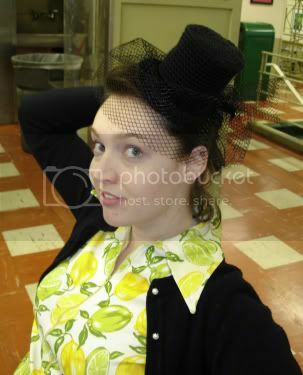 LadyLinoleum: (I pipe up) What kind of hat? Faith enters the meeting area at the Old Farmers Market and is plunking down her supplies for the evening onto our table. 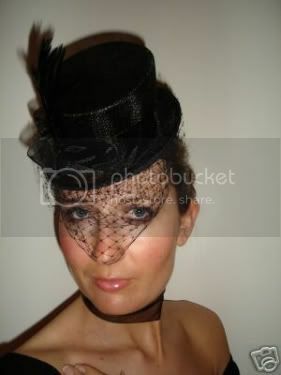 Faith is not only our SNB leader, but she is an accomplished milliner. 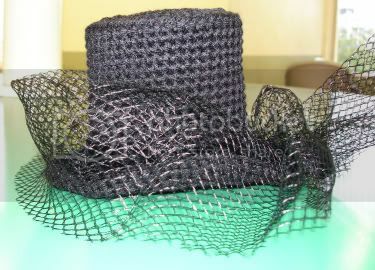 Miss Kendra: (motioning with her hands atop her head like she's holding said chapeau at a slight angle) You know, one of those little black cabaret hats with a netted veil. LadyLinoleum: Oh, like a cigarette girl? LadyLinoleum: (toward Faith) She needs buckram right? Faith: Yes and you (turning to Miss Kendra) can get it in Downtown (LA). LadyLinoleum: (laughing) I'll make you the hat. LadyLinoleum: I'll crochet it of course and it won't look crocheted. Miss Kendra: Is that a bad thing? LadyLinoleum: No. I mean, you'll notice the hat, not the medium it was made from. Miss Kendra: Will it stand up if it's crocheted? Miss Kendra: Okay, you have until next Thursday. It's difficult to decipher in the picture, but I put a little wire in the brim for shaping as well as black velvet ribbon to finish it off. I will also state for the record that it took me longer to put the damn netting on this little diddy than it took me to crochet the entire thing! Now, the little missy above was adamant about the hat being black and shunned the thought of flowers or other adornment. So, since this one turned out so well I will be making more of them. And they will have color and maybe even a feather or two. Stay tuned. Have fun in Vegas Missy! That looks fabulous! You do a great job on everything! Holy crap! I can't believe you were able to crochet THAT type of hat. Ok, I can believe it. I mean, you ARE lady lino after all. But still, DAMN! Awesome, awesome job. you are sooo awesome I love that hat! it looks great! Ooh la la! Makes me wish that I could wear hats, also. Awwwsome!!! Awww, I want one!!! Awryagonna make a pattern?Pulleeeeeeeze?!?!? Cool hat! Kudos on the netting. Red Heart worsted weight and an F hook makes the tightest, stiffest, sturdiest fabric I know of. I use it whenever I make stuffed toys. Gorgeous, Kenra looks awesome in it! Very nifty Hat. You are very creative. Kendra one lucky puppy! The hat is faboo! Sorry I missed last week's meeting the official modeling of said hat. Can't wait to see the colorful versions! this hat is so much fun! man o man i love it. bologna capes and wild crochet hats. what more can this lady do?! This is fantastic!!! Great design!! I love this little hat! It's simply fabulous! Are you going to make a pattern......i really really hope you do.